Whew! It's been quite a weekend here at FRoA headquarters. My interns* and I have been snowed in since Friday. Today I am finally free of my cold wet confines, which is a cause for celebration, yes? I give you: giveaway week, so named because I have TWO giveaways for you. * Cats. They're my cats. We'll start with the one I teased way back when: Soapbox Soaps. 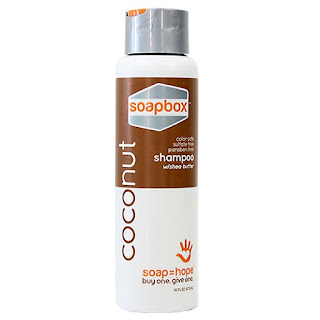 I received their coconut conditioner in an Influenster Vox Box last month I fell completely in love with the product. I have tricky hair - it's VERY long, but it's fine, but it's also frizzy, but it's REALLY wavy. The shea butter-infused shampoo and conditioner soften even my really-need-a-trim ends, smoothes, and shines. All for, like, $6, and you can get it at Target or the drugstore or whatever. Awesome. Awesome indeed, if that were all. Here's what earned my customer loyalty: not only does Soapbox run clean drinking water programs around the world, and not only does Soapbox give out bars of soap to those in need, these products are 100% CRUELTY FREE. This is so important to me. I've been trying to phase out all my animal-tested products. It's tougher to do than I would've imagined, but I'm dedicated to finding a swap for all my beauty and hygiene products even if it takes awhile. If you want to argue the necessity of animals in medical testing, okay; there's a shade of gray there, always provided of course that experiments are conducted as humanely as possible. For beauty products, though? We don't NEED those. We don't NEED to slap shadow on our eyes and lipstick on our lips. We don't NEED specially formulated shampoos with ingredients that could apparently mess us up hence the testing. There is NO REASON to test beauty products on animals, ever, and that is why Soapbox is now my new go-to for shower products. Wow, these products sound awesome although to be honest, I like the sound of the coconut one you use a little better (seems we have similar hair; long, thin, frizzy, wavy... Uhg!) I've just recently discovered Lush products and can really get behind their cruelty-free stance however they're kind of pricey! Thanks for sharing. I'll have to check my local drug stores! I've never heard of this brand but it sounds like something I'd love to try! Sounds like a great company! I don't actively seek out cruelty free companies, but if I'm trying to choose between two products and one is cruelty free, I'll pick that one. I randomly bought face wash recently that was CF and I was really happy to find that was a feature after the fact. I love the cause of this company! Would love to win!!! Oh these sound amazing! Thanks for the chance to win! I have used Soap Box Soaps but never tried their shampoo and conditioners as of yet and would love too! I use only cruelty free and organic products as I was forming an allergic reaction to what they sell at the store and when I changed the hair care products I use to only organic and natural my scalp and hair did a 360 and have been super healthy. Okay, you made me want to try the shampoo and conditioner because my hair is everything you described, except moderate waves. love Soapbox- the black soap. is. heaven. other good cruelty free are Elizabeth Mott cosmetics, Shea Moisture, and Yes To! I love Soapbox Soap, especially the black charcoal bar. My favorite cruelty-free brand is Weleda. Their sea buckthorne hand cream is like sunshine in a bottle! I'd love to win because I keep hearing how wonderful your products are! I'm also interested in Lush for their cruelty free products!